The weather will be quiet on Tuesday, but gusty winds and rain are on the way for Wednesday. High pressure located north of the Finger Lakes is bringing the ‘calm before the storm’ to the Finger Lakes on Tuesday. No precipitation is expected throughout the day and winds will generally be light. A northerly flow is trapping some low level moisture from Lake Ontario over parts of the region. This is being manifested in the form of some cloud cover. While this has kept overnight temperatures in the low 30s for some, it will keep high temperatures from getting much past 40 degrees this afternoon. For those areas where some sun does break out- mostly across the Southern Tier and western Finger Lakes- temperatures may make it to the low or even mid 40s. Temperatures will slide back towards the low and mid 30s this evening, but should rise a couple degrees over the course of the night between 9pm and 3am. After 3am, the wind will start to pick up and rain will approach from the west. Temperatures will continue to rise into the 40s. 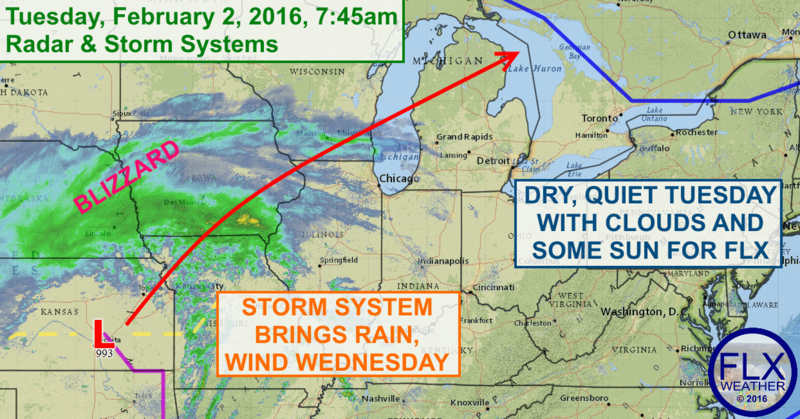 By dawn Wednesday morning, rain should be widespread across the area and winds will be strong. Most areas will see gusts over 30 mph, but the higher elevations could see winds in excess of 40 to 45 mph. Some embedded heavier showers may also bring strong winds to lower elevations, and a rumble of thunder cannot be totally ruled out. Rain amounts will be higher just east of the Finger Lakes thanks to terrain influences. Generally around a half inch should be expected in the Finger Lakes, with an inch or more from I-81 east. The rain should taper off from west to east during the middle of the afternoon. At about this same time, the temperatures should peak in the low and mid 50s. Many areas will challenge record highs for February 3rd. Temperatures will start to fall during the evening as cooler, dry air works in. The rain will become limited to a few spotty showers and the winds will start to die down as well. Much of Wednesday night will be dry with light to moderate winds as temperatures tumble towards the low 30s by dawn. Thursday looks dry, but cloudy. Temperatures will rise to the upper 30s. Some lake effect snow may sneak into the northern and eastern Finger Lakes for a time on Friday and early Sunday, but it should be well north of the area on Saturday. Only minor accumulations should be expected. Looking at the long range pattern for the month of February, it looks like some substantial cold will move in towards the middle of next week and stick around for a couple of weeks. I would not be surprised to see another surge of warmth towards the end of February, but think March will be cold and possibly stormy.